On the 15th anniversary of the teens' disappearance, the FBI sought the public's help on billboards in Pennsylvania and Ohio. Tip? Call the FBI in Pittsburgh at (412) 432-4000 or in Cleveland at (216) 522-1400. New York (CNN) -- As is the case with so many other "Jane Does'' across the nation, 14-year-old Sarah Boehm's unidentified remains were kept in a cooler at the coroner's office in Cuyahoga County, Ohio. They had been there for more than five years when a breakthrough in 2001 helped turn the case around. Lt. Kim Clements, a detective with the district attorney's office in Beaver County, Pennsylvania, noticed a description of remains matching the missing teen's as she searched the Doe Network, a website for tracking unidentified and missing persons. A sample from a femur and a DNA swab from Sarah's mother confirmed the body was Boehm's. She disappeared on July 14, 1994, in Rochester, Pennsylvania. Clements was transporting a witness in an unrelated homicide case when she learned of the match. The DNA results didn't come back until 2003 because of a long backlog at the FBI lab after the September 11, 2001, terrorist attacks and because the initial DNA sample was insufficient, police said. Clements said learning of the match was ''a pretty intense moment'' in her career. Sarah's family held her funeral in 2006, finally laying her to rest. While one part of the mystery was solved, authorities are still struggling to find Sarah's killer. And they still don't know if she was abducted, ran away or just got into a car with the wrong person. And, investigators still don't know how her body wound up miles away in the Berlin Reservoir, part of a wooded state park in Ohio. The park is about a two-hour drive from Sarah's home. Authorities believe Sarah's case may be connected to the similar death of Kathryn Menendez, a 17-year-old girl who ran away from her home in Portage County, Ohio, more than a dozen times. How does a 14-year-old girl go missing and end up in rural Ohio? Their bodies were found just 800 yards apart. Menendez was strangled and authorities think Boehm may have died the same way. While it took months for hunters to discover Boehm's skeleton, Menendez's body was spotted just days after she vanished in August 1994, a month after Boehm's disappearance. Boehm had no history of running away, no known drug habit or history of alcohol abuse, and no connection to Ohio. There was no known explanation for why her body wound up where it did, said FBI agent Thomas Carter, who is investigating the case for the bureau's Pittsburgh field office. Boehm disappeared after telling her brother she was going to a friend's house two blocks away. But she didn't visit that night because the friend's family had company. A few days later, Sarah's family found a two-page note under her pillow. A Pennsylvania state police lab analyzed the note, which was written in different inks, and cast doubt on its authenticity. The note, which has a French poem Boehm wrote on the envelope, indicates Sarah might have planned to run away. But the FBI isn't ruling out the possibility the note was planted. "How does a 14-year-old girl go missing and end up in rural Ohio?'' Carter asked. "Did she actually leave the house that night with the intent of running away, or did she walk out of the house and someone pick her up and take her to Ohio?" Over the years, authorities have eyed several potential suspects. To this day, some have not been ruled out, Carter said. 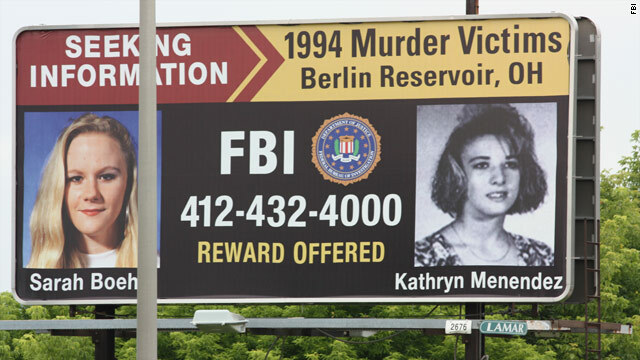 During the summer of 2009, the 15th anniversary of the disappearance of Boehm and Menendez, the FBI put up billboards featuring their cases along highways in Pennsylvania and Ohio. He could not find the marker and said he felt as if he had let her down. Boehm said he would like to see someone brought to justice for what happened to his daughter. "I want to do everything in my power to find out what happened to her. I can't rest until I find out,'' he said. Carter said he needs the public's help to crack what may be a double cold case. Anyone with information on the case is asked to call the FBI in Pittsburgh at (412) 432-4000 or in Cleveland at (216) 522-1400.